The best houses are full of surprises, offering as many different faces to the world as we humans do ourselves; being one moment open and welcoming, the next private and reserved. 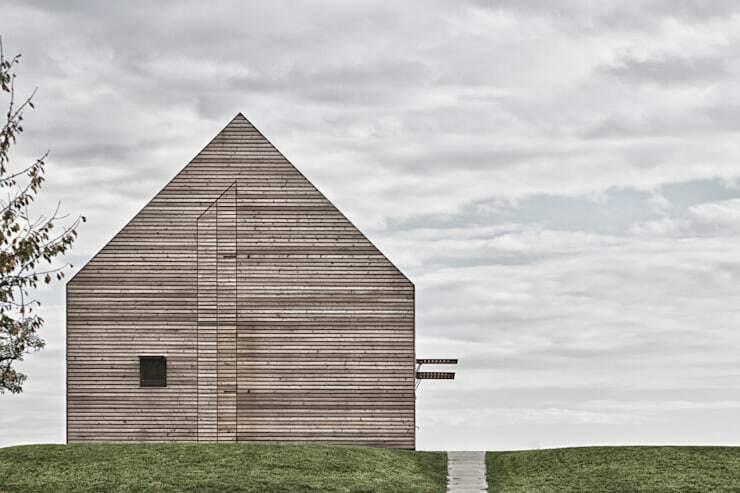 There are some architects who take this more literally than others – and the members of the Viennese firm 24gramm are clearly among them, as demonstrated by the fact they created this very special summer house in Austria’s Südburgenland region. It’s built to be adaptable, and to change its facade to suit the weather outside and the moods of the people within. Seen from this angle, the house gives little away. 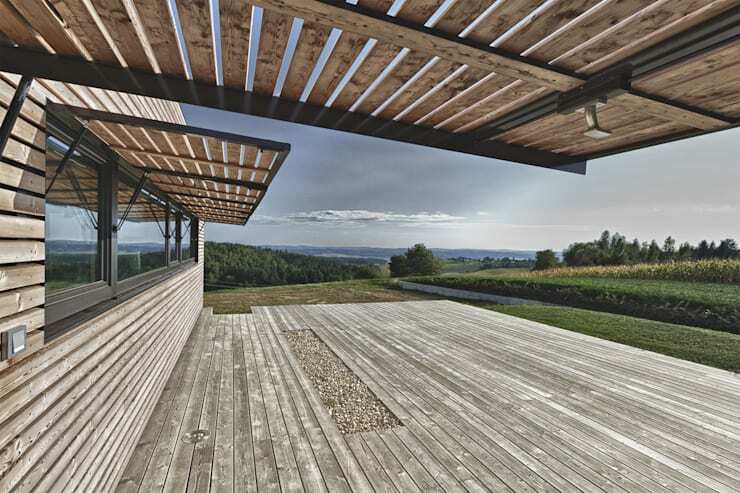 It exhibits a rare consistency of materials across almost all its surfaces, with only the windows – the wooden covers of which are raised to display the glass beneath – standing out against an expanse of narrow wooden planks. 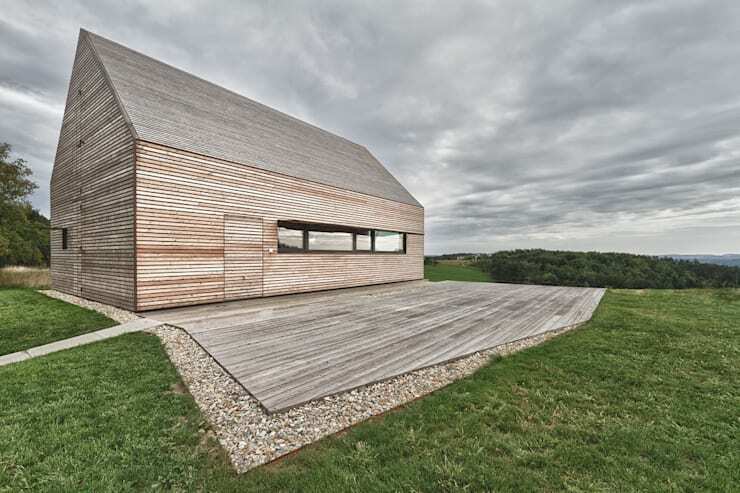 Even the door is camouflaged, completely invisible from a distance, and the decking in front of the house is made from a similar style of wood. 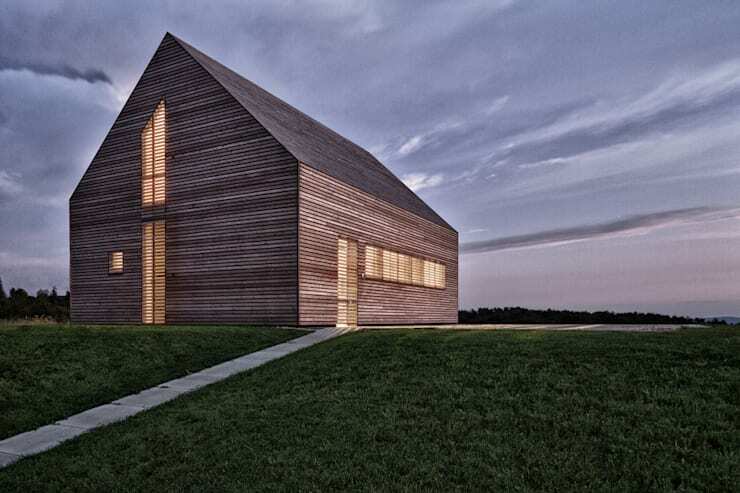 Its form closely resembles the silhouette of the house, almost like a shadow. 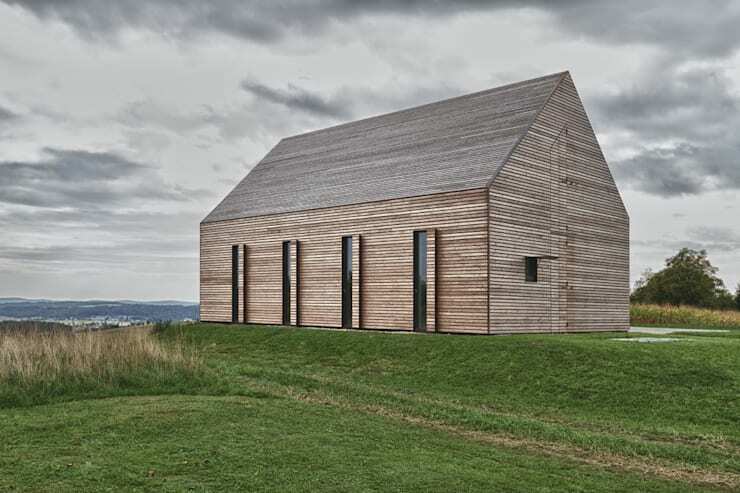 With storm clouds gathering, the house appears to be buttoned up against the cold, protecting itself against the elements by hiding away within its protective wooden shell. 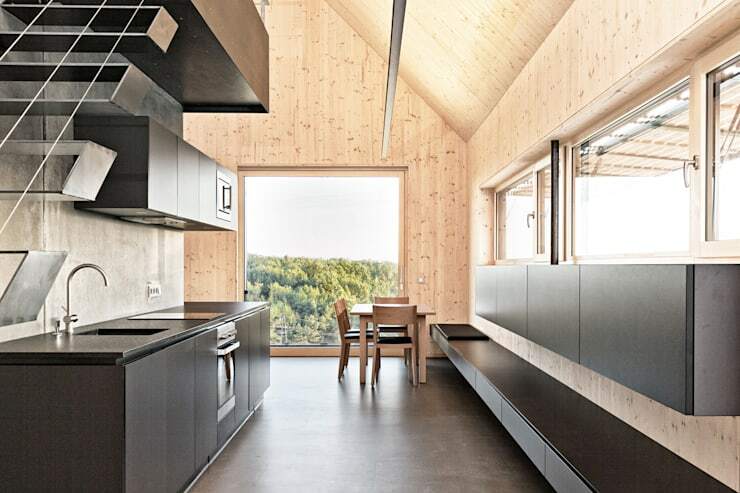 But in reality, of course, the wood actually is the house itself, not a coat; remove it and the bare structural elements beneath would be left exposed. The particular shape of window seen here – elongated vertically, and extremely narrow – is very unusual in contemporary architecture, and is slightly reminiscent of the slits designed to be used by archers defending medieval castles. This association, again, adds to the impression that the house is very self-contained, closed off and fortress-like. 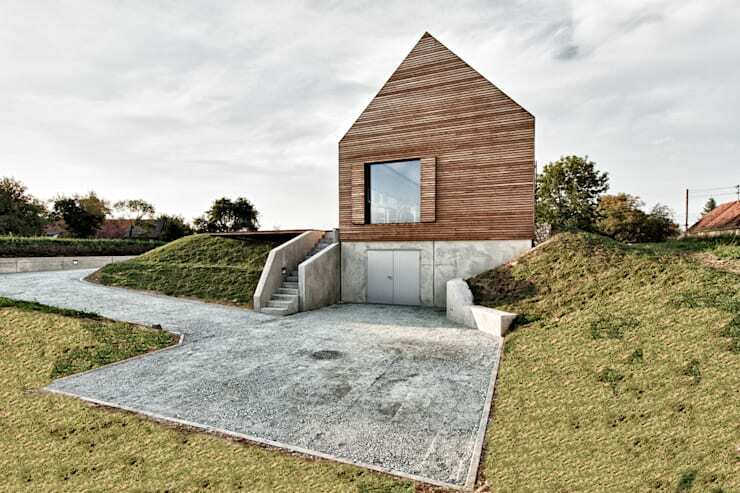 A casual observer might well think this house was all wall. But all of those outlines mark out unconventionally shaped windows. Seen by night, the entire building appears to have taken on a new character: snug, warm and welcoming looking by contrast to the dark night sky, the house emits a rosy glow from between the very narrow gaps between its shutters. One gets the definite sense that whatever the inhabitants within are doing, they must be very contented doing it. There is one – and only one – less avant garde window on the house, though we’ve had to walk all the way around the building to find it. Notice also that this side of the house offers the only divergence from the uniform construction materials of the other three, branching out (most unexpectedly) into concrete for the sunken portion of the building. In the right weather conditions, these shutters could act as shields from the sun. The interior of the house shows the same dedication to a particular aesthetic as the exterior does. Even the bed matches the material of the walls here. Downstairs, the effect of that single square window is very impressive indeed, framing the landscape beyond like a living oil painting. 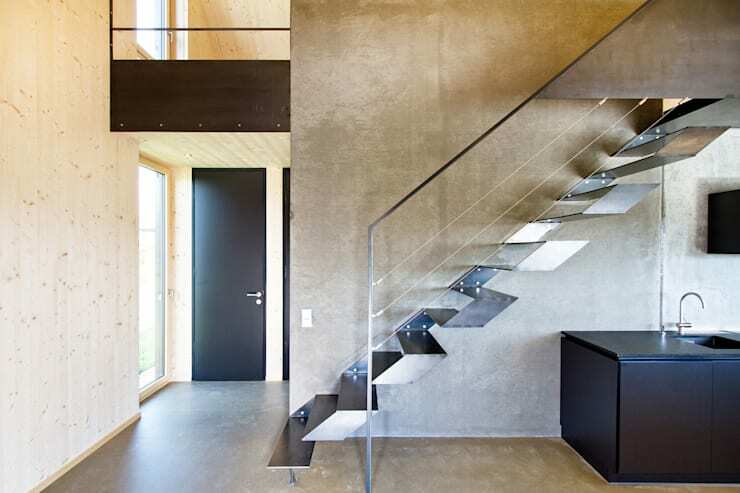 The first few attempts to climb these remarkable zig-zag steps are likely to be pretty daunting, but it's absolutely worth it for the uniquely daring edge they bring to this interior. What do you like/dislike about this house? We want to hear your opinions!